Martha has called her home on Mount Desert Island in Maine her favourite spot. High atop Ox Hill, 384 feet above sea level, the former house of Edsel and Eleanor Ford features sweeping views of Seal Harbor, 63 acres of wooded land and easy access to Acadia National Park, where Martha is known to go hiking each summer. Martha purchased the home after a cocktail party she attended here in 1997, thrown by Mrs. Edward Leede, the second owner of the home after the Fords sold it. Martha fell in love with the property instantly. When she discovered that Leede was looking to sell her home, Martha stepped in to sign the check. 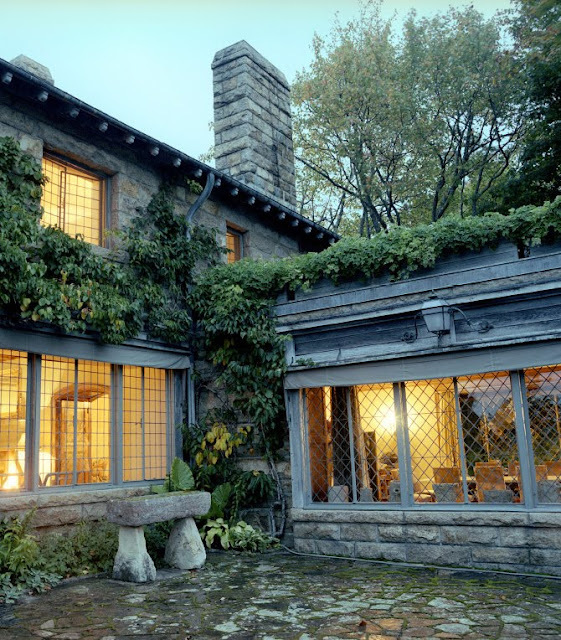 The 35,000 square-foot house was designed in 1925 by New York architect Duncan Candler, who also designed public buildings in Manhattan and several residences for the Rockefellers. The rectilinear floorplan of the home is in direct contrast to the curvaceous and wild landscape surrounding the property but in keeping with the ‘rusticated’ motif that was popular for summer residence design at the time. 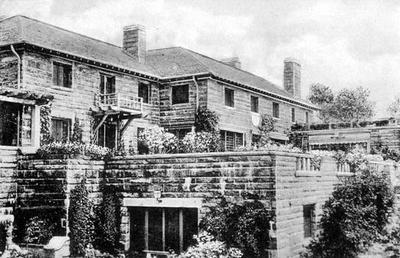 Made entirely of pink granite, most of it quarried on site, the 12-bedroom, 3-storey home was designed in an Italian revival style, borrowing heavily from the beaux-arts, prairie designs of summer houses on the island that were built in the late 1800s: formal gathering rooms, expansive kitchens, a vast laundry facility, lavish bedroom suites and multi-paned leaded-glass windows that open widely to the outdoors. Skylands features large patios, terraces and pergolas, where Martha grows kiwi vines, displays palms and ferns and encourages moss growth. The outbuildings on the property include a guest cottage, a play house with an indoor squash court, mechanics' garage, greenhouse, stable and a 200-seat Catholic church. Martha has found numerous treasures stowed away in some of the old storage rooms, including Tiffany silverware. 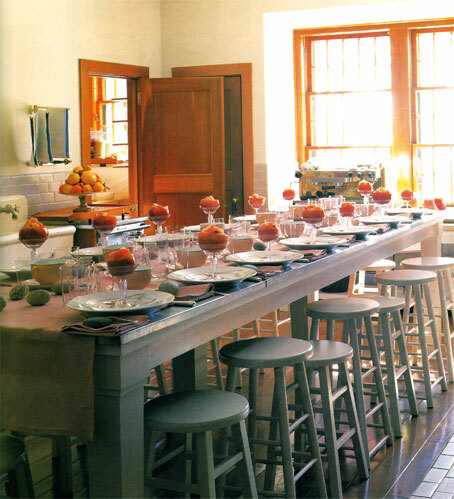 She discussed some of her findings in an interview with the UK Financial Times: "I bought the house fully furnished, with everything from the original light fittings to Mrs. Ford's Danish and French china, including a large service of highly collectable Orange Fitzhugh. The air-conditioned wine cellar was fully stocked with a collection of 1982 Bordeaux." The landscape at Skylands is very hilly and rocky, with large swaths of moss under tall hemlocks, white pines and Douglas firs. 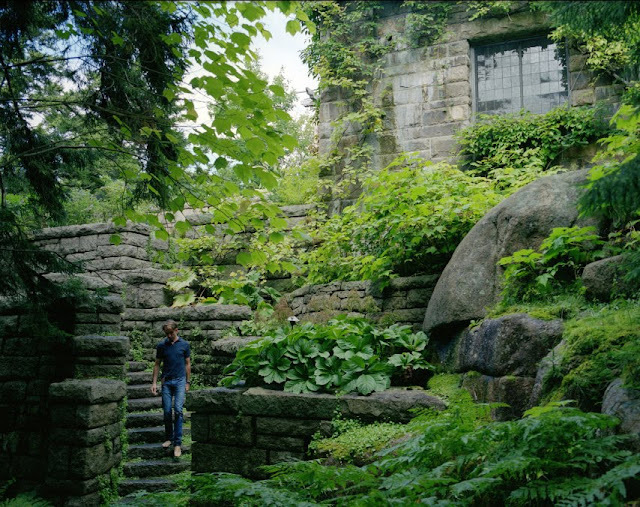 Danish landscape architect and city planner Jens Jensen, who adhered to a prairie ideal of open spaces and natural plantings, designed a free-form space of pine-needle covered pathways through the woods, reflecting pools, moss gardens and a communal sitting circle in the forest where guests could gather around a fire and talk. "I love to bring guests," she says. "This is an ideal home for entertaining. In fact it's my ideal kind of house - spacious and quiet." Each fall Martha adheres to the plans Jens Jensen set forth for the owners of the property; she and her staff gather up the pine needles from the pathways and use an antique rotational mechanism designed to filter out flotsam and jetsam from the piles of needles (leaves, bark, acorns and seed pods from deciduous trees) leaving only a pristine collection of golden needles. Similarly, the crushed pink granite on the roads of Skylands is collected before winter, professionally washed, to free it of mud and grit, and stored until the following spring. Skylands has ample waterfront, which is accessible by road from the main house. It is where Martha keeps her yacht, the Skylands II – a Hinckley designed wooden picnic boat. 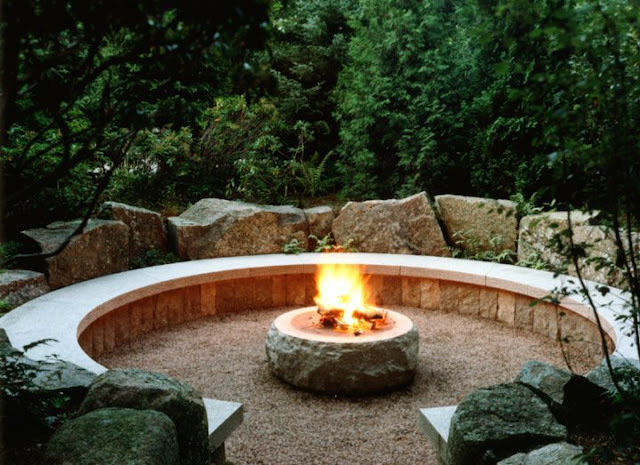 The home has been the focus of many gardening and decorating articles in Martha Stewart Living magazine and there is a collection of Martha Stewart Signature furniture designed around the aesthetics of the home’s décor. The Great Hall at Skylands features a large fireplace, views of the Atlantic and a table, 9 feet in diameter, which holds a collection of antique books about Maine and Mt. Desert Island. 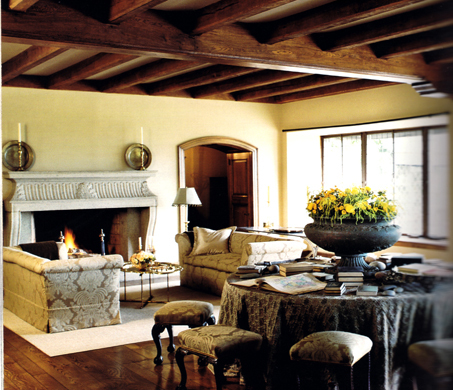 The sofas and stools are upholstered in fine wool damask. 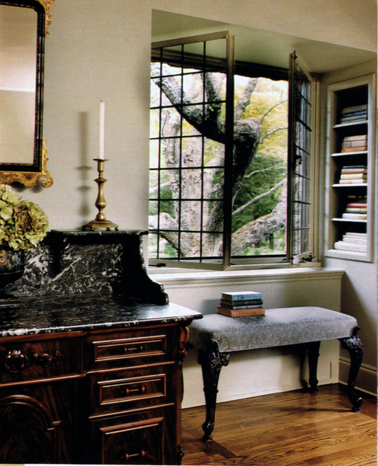 Luxurious details in one of the twelve bedrooms. 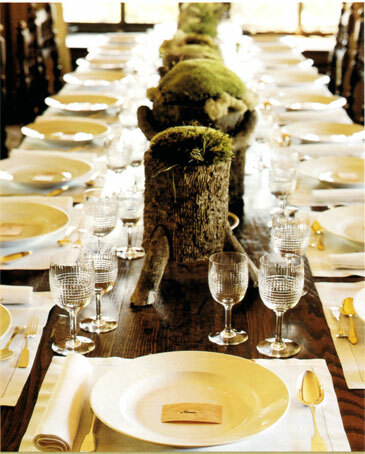 A table set for a party with faux-bois planters down the center of the table planted with native woodland mosses. The kitchen at Skylands is a wonderful, casual space. 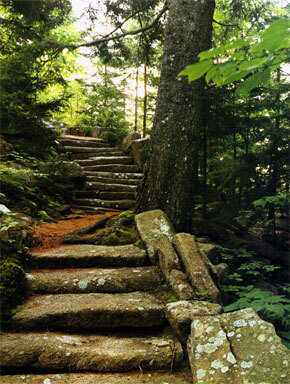 Rustic stone steps connect meandering pathways on the property. 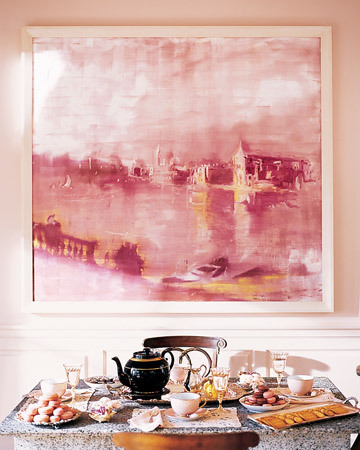 A pink palette for the Georgian-style guest house echoes the colours of the oceanic sunsets and makes subtle reference to the prolific pink granite on the property. 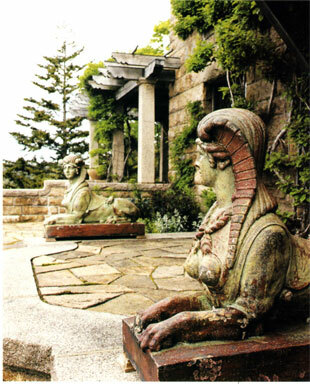 A pair of glazed terra-cotta sphinxes designed by Emile Muller found a home on the Skylands terrace after years in storage. Martha keeps other outdoor sculptures on the property as well, including a 1935 bronze of a reclining woman called La Riviere, by French artist Aristide Maillol. Skylands as it appeared in the 1920s. J'aimerais beaucoup voir plus de photos de l'extérieur de sa maison de Skylands, autres que celle que nous avons vu dans sa revue. Mais c'est quand même une belle demeure. Ecruitiatingly beautiful, sublime, healing. If I could only visit I would not dream of travel again. Martha, you ae blessed to have seen, touched and owned such treasures. Thanks for the beautiful pictures. I love Martha's decorating skills. The pink room with the fireplace is great. Nice house. I would have bought it if Martha passed on it. We recently spent our vacation on Mount Desert Island, overlooking Basws Harbor. This is a marvelous area, with many peaceful venues and very friendly people. My preference, when spending time at any vacation location, is to be close to my family. Because of this, I prefer smaller, more intimate spaces, but enjoy many of the techniques used in Martha's house when they are applied to the "not so big" versions. I have just returned home from a reunion of sisters, brother, and spouses in the area of Mt. Desert. Our view was the quiet side of the island, which was so serene, but there is not even a tiny space of MDI that is not intriguing in some way. I hope I can return year after year. It is very clear why you had to buy Skylands. Thank you for sharing these photos with us. Martha Stewart's decision to buy the wee cottage with all furnishings gives me hope. Others with means seem to "fall in love" with a home, and then proceed to destroy it, giving more credence to my belief that a lot of the wrong people have money. Martha is clearly significantly smarter and has far better an aesthetic sense - and, an appreciation for the history of the wee place. (I bet polyurethaning everything in sight is not in her vocabularly, either). Real class.